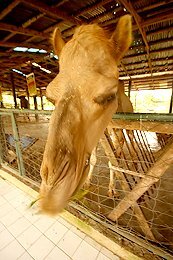 Paradizoo is a relatively new attraction in Tagaytay. It is made by the people who gave us Residence Inn. 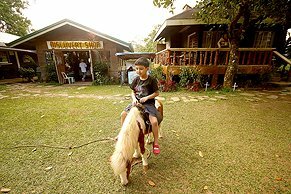 Although, technically, it is already in Mendez, Cavite, it's only a few kilometers (15 mins) away from Taal Vista Lodge, and is very easy to get to. 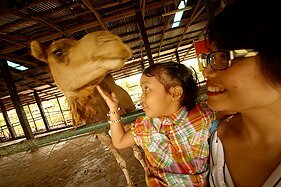 Paradizoo is a 7-hectare farm-themed petting zoo where visitors can have interaction with the zoo animals. 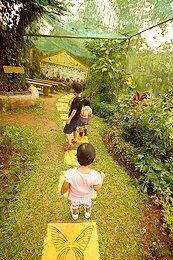 The fee is P500 for adults, P375 for kids 4 to 8 years old and free for kids 3 and below. 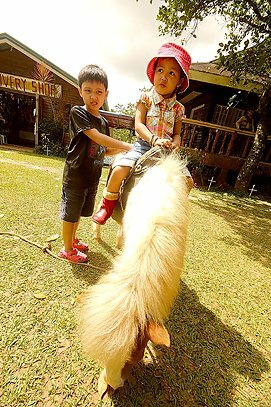 At the entrance, you will be greeted by a 3 foot tall miniature horse, which you can ride for P30 per one short round about. Being with kids and seniors, it may be a bit difficult to walk all 7 hectares, so what we did is we rented a carabao cart to take us through the whole tour. 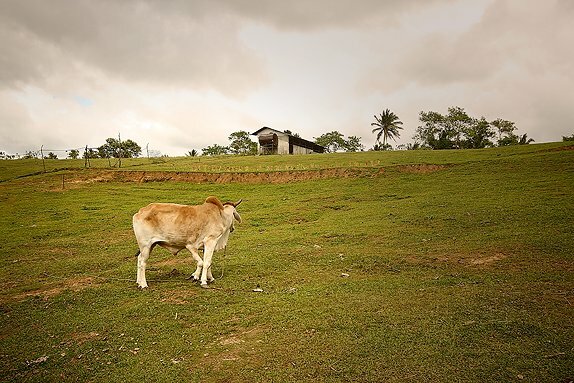 The carabao can ride a maximum of 4 adults, at P100 per head. 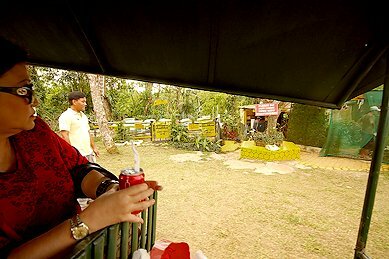 It's worth the price, actually, you'll be able to experience a carabao ride while seeing the whole zoo. 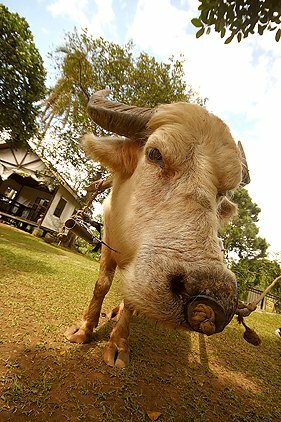 Did I mention Carabao Ride experience? 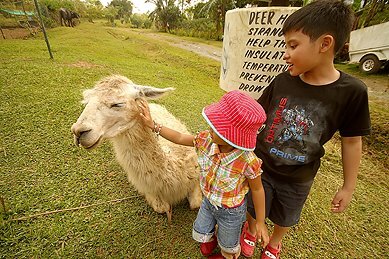 Our first stop was the Llama, which originated and was first domesticated in South America. 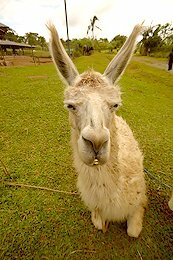 The Llama usually spits on predators when threatened, but this Llama was trained not to spit on people, so anyone who wants to can pet it. Next, we went to to the Butterfly Aviary. Its full of butterflies, what more can I say? Oh yeah, you'll have to watch out for hairy itchy caterpillars (higad in tagalog) hanging on the vines. Beside it is the Bee Farm. The bees used for harvesting are species from Italy, as the beekeeper said. These species are easier to domesticate as they have better temperaments than the ones endemic to the Philippines, and produce more honey. At times, the surrounding local bee communities will try to attack and steal some of the nectar these western bees have collected. So the caretakers provide some protection, at least not to devastate their western bee community. Our next stop was the fish pond. Here you can rent fishing poles and catch Tilapias, which is a specie of cichlids. Although we were in a hurry so we weren't able to try it out. Across it is the hydroponic garden. Hydroponic farming is a method of growing plants without the need for soil. Although we were disappointed when we entered their garden as we didn't see any hydroponic plants. Everything there was planted in soil. We didn't bother to ask though, maybe there was a good explanation. Or none. 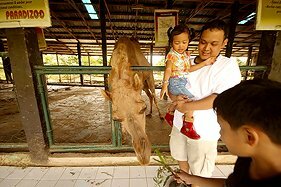 After this, we rode the carabao downhill to the Camel Stable. This was our last stop. I was surprised at how big these camels were. They were about 8 feet tall upto the tip of their humps. The guide said they were still young and will grow double their current size. 16 feet tall? Well, I'm not so sure about that but I'm already amazed as it is. My kids fed the camels some weeds the guide gave us, and they are friendly enough to get really close and take some pictures. Beside it is the goat milking station. They were asking us if we'd like to try out milking the goat but my son refused. Another attraction at those stables is the five-legged cow. Nothing too special about that other than the freaky abnormal extra limb. 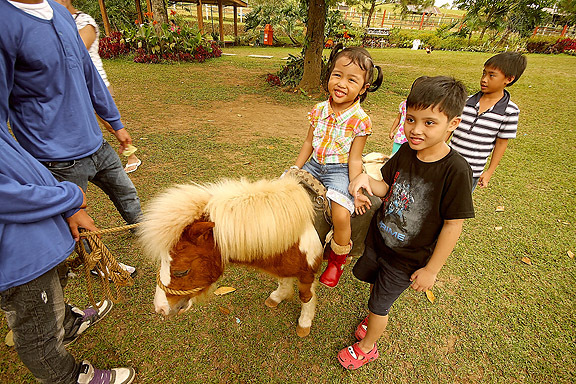 Finally, we went back the the base station and my children rode the miniature horse. From the Tagaytay Rotonda, drive straight going to Batangas. You'll pass Summit Ridge on your right, and then Taal Vista Lodge on your left. After that, turn right on the next intersection which is Mendez-Tagaytay Rd., landmark: Savemore. Drive 4.32 kms. then turn left and then you'll get to a fork, go left then you're there.